Our downtown was small, a four-block Main street separating facing buildings, railroad tracks parallel to the south. The railroad tracks also marked the beginning of the poor black part of town—the part I lived in. To the north was where the white people lived, and regardless of their wealth, or lack of, they were seemingly better off than we were. At least according to my parents and grandparents. My pop and grandpop claimed we couldn’t hide our poverty, even when we had money in the bank. No currency bought white skin in 1974. But to me life seemed less sinister and more bright than the way my parents saw it. My father had a small appliance repair in downtown since 1968, which meant that I was recognized by downtown merchants as a “good boy” and my father “one of the good ones.” Pop ran a good shop, did good work, charged fair prices, and even though he often found prejudice in certain words and actions, his business fed us and he traveled each day across the tracks, opened a business among white businesses, and interacted with them every day without a problem. It as from Pop that I wanted to be in business. I saw the respect everyone had for him when he repaired a vacuum cleaner or a small engine. I saw how relieved they were when he came to their house and repaired a washing machine for 2% of what a new one cost. Even at 13 years old, I knew that capitalism—if done right—would bring people together. Dr. King had proven in the bus boycotts that money is green. I asked grandma why there was no black people in the paper, but she told me to hush and read the comics. “Stop looking for hurt,” she said. Now I was looking for ways to make extra cash and the ad promised 7 cents profit on every paper sold. I cut out the coupon and about two weeks later, I received a manila envelope with all the information needed to get 25 free copies of Grit: America’s Number One Family Newspaper to sell. They even sent a canvas bag to carry them in and an official salesman pin. My intention was to peddle these papers downtown with my pop’s store being my ground zero. I was clearing $30 a week at seven cents a paper profit in only a month’s time, but it was the tips that created the actual size of the revenue. The paper was twenty cents a copy but people would give me a quarter almost every time. Some people would even give me extra pennies from their pockets with the quarter, all of it adding up. They called me “Grit Boy” and the appellation didn’t bother me. I ignored condescension when it arose, but the majority of the folks downtown were nice to me—respectful and helpful—and there were times I forgot that I was black in the 1970s in the North Carolina foothills. The merchants looked for me every Tuesday, as did lots of people on the streets in town. They’d whistle for me, holler at me—“Hey, Grit Boy! Paper here!”—handing me dollars which I would change from the change machine on my belt, purchased with prize points from the slick Grit Magazine we’d get once a month, complete with pictures of white faced boys from across America who’d won bikes and record players. I loved the sound of that changing machine, and I knew the levers by heart, thumbing out three quarters and a nickel change, often putting the tipped nickel back, sometimes a quarter, sometimes nothing, often a “thank you.”. Sometimes people looked at me, but more often than not, they looked at the canvas bag around my shoulder, the paper as I handed it to them, their change purse as they fingered change for the twenty cents. I didn’t take offense at it. I think they were maybe ashamed at something they ought not to be. Me, I was interested in delivering a product that they enjoyed, and I didn’t care who bought it. Money is green. 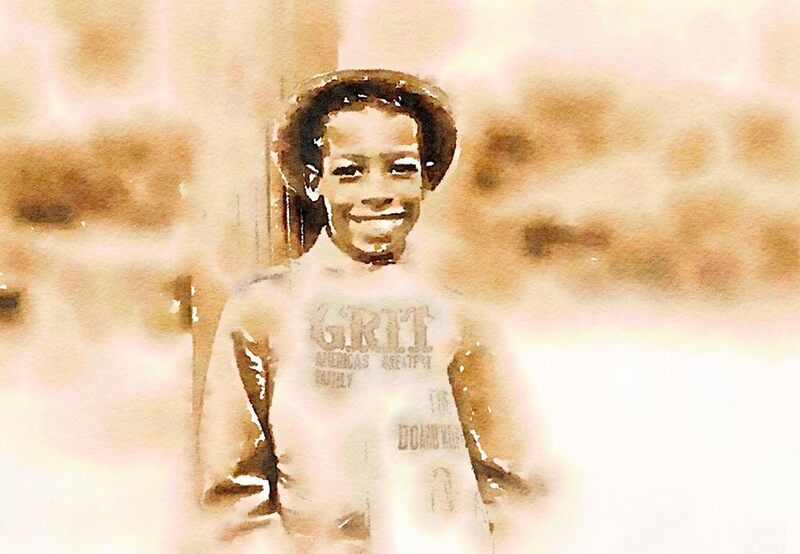 I was Grit Boy and at about $120 a month in profit, I was going to become Rich Boy. The businesses downtown didn’t seem to mind my peddling the paper to them and their customers. Only two places were off limits: The hobby store, run by a mean old man who hated children but had decided selling toys, model cars, and GI Joe was the best vocaion, and Burt’s Bar and Grille, where beer was sold. Old man Steen who owned the hobby store ran me off the very first time I’d went into his store, screaming, “Get outta here! You stay outta my store! You don’t sell in here!” So, I stayed out. Crazy people are best left alone. Those images scared me for about two minutes. The drunk people I’d met were almost always black. And if white people could be angry about the past, black folks could too. Seemed to me that alcohol made anyone who drank it angry about the past, but I still stayed away from Burt’s. However, Burt always found me. Burt was a woman—a big lady—as wide as she was tall, blond hair mashed under a hairnet, teal uniform, with a stained apron, white shoes like a nurse wears. I’d see her between 2 and 4 pm almost every day during summer, walking from the alley behind her Bar to either the Woolworth’s or McClellan’s Five-and-Ten. She’d sit at the store’s lunch counter and drink cola and eat. Odd that she cooked in a bar bit ate liver and onions at the Woolworth’s lunch counter. Every so often she’d see me, holler “Grit Boy! C’Mere!” and I’d pretend not to hear, go out the door into the humidity. However, she’d sometimes corner me in a store or even by the Coke machine by the pharmacy. “Hey, howabout bringing me one of them Grit papers ever time you get one?” She’d buy one and I’d promise to come see her, and then I’d never go because of the fear of the drunken Civil War Confederate soldier lynching me. One bright August day, the sun high in a Carolina blue sky, Burt caught me buying a Cheerwine from a drink machine near the Deluxe Barbershop. I looked at the ground and felt kind of bad. The tenor in her voice sounded as though she was hurt, not mad. It reminded me of the way my mother sounded when she talked about Jesus and everything He went through. She laughed. “Kid, I sell more hamburgers and hot dogs with onions than I do beer,” she said. “Ain’t no drunks allowed to hang around my place, “ she said. “Me or James chuck ‘em out. Do you know James? He’s colored too. He cooks for me, cleans up, washes dishes.” She said it like me and James had a common ailment and that him working for her meant that I should probably work for her too. I was thankful she didn’t ask me if I knew him. White people seem to think all black people know one another. I’ve often thought maybe white people all know each other too. I was still scared to go in there, but I knew that if I didn’t, I’d just keep running into Burt and making excuses. So the next week, at the end of the route, I stopped by Burt’s Bar and Grille. All of the men looked alike to me, middle aged, dressed in different outfits from shirts and ties to jeans and shirts with their names stitched on them. Sam. Robbie. Earl. My father’s name is EarlI, I thought. This white man has my Pop’s name. I wondered if he has kids. I wondered if his kid read the comics I read. The stand out in the crowd was a younger man with a scowl, staring ahead, a pile of dollar bills mixed in front of him. Also sitting on the table were six empty beer bottles. “Hey! James, bring me another beer, please!” he said. Money Man shook his head. “No, Burt, not slaves. Hard workers. Hardest workers I’ve ever seen,” he said. James rang the register and put a quarter on the table, his lips tight as though working to keep words inside his mouth, words he knew that must never, ever come out. Storing them under his tongue, hoping that there would always be room for them there. Money Man said something to James I couldn’t hear, and James’ face tightened a bit more. He disappeared to the kitchen. I turned, went around the bar and toward the door. I felt eyes on me this time, eyes I hadn’t felt coming in. I opened the door and the bell above my head rang clear, the heat from outside fussing with the air conditioning inside. I stopped. Heat, cool. Bell jingling. I looked. It was Money Man. Aloft in his the fingers of his right hand was a dollar bill. I took three steps, pulled a paper from my bag, changed it for the dollar, went to the change machine on my belt. I nodded, stumbled a bit, stepped back, pulled at the door. Jingle, heat, cool. I looked. Money Man again. I couldn’t really see at whom he was pointing. I pointed at a balding guy whose back was to us in a booth. I went to the balding guy’s booth. “He bought you a paper.” He took it and didn’t even look back at Money Man. I went toward the door again. Jingle, heat, cool. Not to bore, but Money Man bought a dozen more 20 cent papers for a total of 15 and told me to “Keep it!” every time. The last time, I showed him the empty bag, which he stared into with red eyes. “Sold out! Gone!” he said. And so was I. I opened the door so fast the bell danced from its string and hit the floor as the door closed. I took off toward my father’s store, pocket stuffed with cash. I told my father what happened and he looked at me as though I was one of the dummies that sat upon a ventriloquist’s knee, his face a combo of amazement and exasperation. I shook my head. I was going to say that he spent it buying Grit for everyone except the mayor, but my father went on. I was at a loss. It was a business transaction, nothing more. Like the other people on my route, he’d bought papers. A product. He said to “keep it” with each dollar. “You can. But I’d try and stay outta that area. Keep low the next couple weeks,” he said. I was scared and mad. Scared of running into a sober, mad white guy who might want more than his 15 bucks back, but mad at myself for not realizing what was happening at Burt’s Bar and Grille. I’d let my fear and greed overwhelm me and now I was in an unenviable position. For the next month, I ran my route. Literally. If bikes had been allowed on the town’s sidewalks, I’d have delivered my Grit that way. I avoided Burt’s Bar and Grille and Burt, hiding in alleys, behind drink machines, and even in the backseat of a DeSoto when I saw her coming. One afternoon, as the cooler air of fall pushed the humidity of summer lower, I took an alley shortcut called “Bisener’s Squeeze” to get to Main Ave from second street alley. The “Squeeze” was a three-foot wide opening between two buildings that adults turned sideways to navigate. If one were too fat or too tall, one couldn’t get through The “Squeeze” without, well, squeezing. We kids could walk through it fine, but grownups usually avoided it. I was halfway through the redbrick claustrophobia of The “Squeeze,” when a grown man entered it from Main Ave. I had to quickly back out. I was skinny enough to turn, especially when I saw who it was. I got ready to run, but my canvas bag got caught on a gas meter and I went sprawling, elbows and knees akimbo as Money Man came out of the crack of the squeeze, leaning over me, offering his hand. I ignored it, got up, thought about running, but my bag was still hooked to the meter and I didn’t want to risk tearing it. Money Man reached and unhooked it. “There you go. Hey, you’re Grit Boy. Give me one of them papers.” He reached in his pocket, pulled out a dollar. I handed him the paper, sweat burning my eyes, fear spreading like fire. I took the dollar, folded it into my pocket. I nodded, wishing I had a rag to wipe the sweat from my face and arms. I don’t know why I was so afraid. He was doing nothing to make me afraid. It’s almost like my fear was second nature. “I own the carwash over on 7th,” he said. I nodded. Turned to go. I nodded, suddenly ashamed I was afraid of this man. I felt kind of…glad to know him. I took off up the alley, proud of myself and my town. Heck, my country. I had Grit papers to sell and everyone in my town depended on me.